Sorry for the dearth of recent posts. I have a few that are currently in writing limbo; that you all need not wait longer, here's an entirely different post. 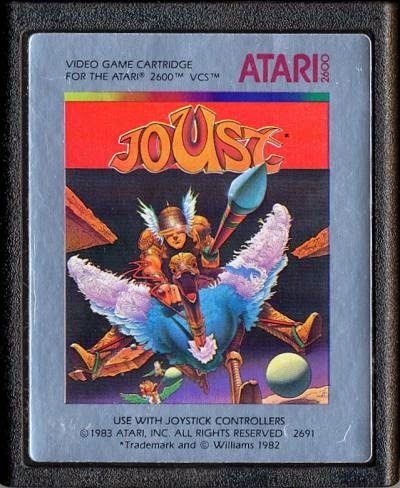 This may not be news to those of you who read this blog, but I recommend that everyone interested in video games acquire an Atari 2600 console. It's still my favorite system, and the one for which I've collected the most games. The first difficult question, of course, is where to get the system. One can usually find an Atari 2600 in decent shape on sites like eBay for a decent price (considerably less than a new PS4, at least). You may also be able to find one at a flea market or garage sale for an even better price (largely because shipping costs are not involved, but also because the seller is less likely to be a retro game vendor and hence may not want as much for it). 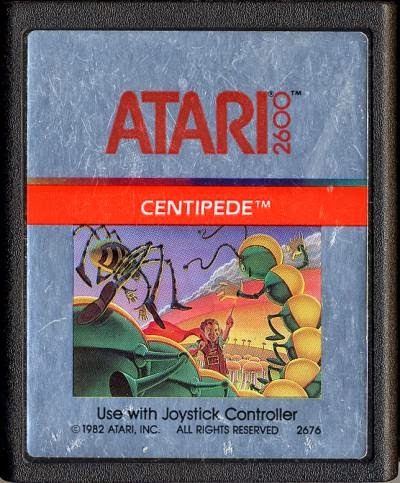 Whatever you do, I hereby challenge everyone who sees this to find and purchase an Atari 2600 (or 7800, since it's backward-compatible with the 2600). The next question, then, concerns games. No use having the system without them, after all. Fortunately, you'll often find consoles bundled with a stack of games, typically loose carts but occasionally games with their boxes (in various states of repair). Even so, the beginning Atari collector (especially one who, like me, was born after the golden Atari age) may be at a loss as to which games to obtain first. Here then, are my recommendations for the seven games that absolutely must be in your collection, and which you should look to obtain first. Okay, I'm cheating a bit on the first one, but these two really go hand in hand. They're the ones you expect to see, and for good reason. These are the ones that come to mind first when the Atari is mentioned. Fortunately, these are the two games you're most likely to get along with a system, even if you weren't expecting them. They seem to accumulate as if by spontaneous generation sometimes, and if you're not cautious you'll end up with a stack of each. Keep at least one of each around, though, because for all their simplicity, these games never get old. Another thing to mention about Space Invaders in particular is its incredible amount of game variations. Most Atari games, if they have variations at all, only have around 10 or so. 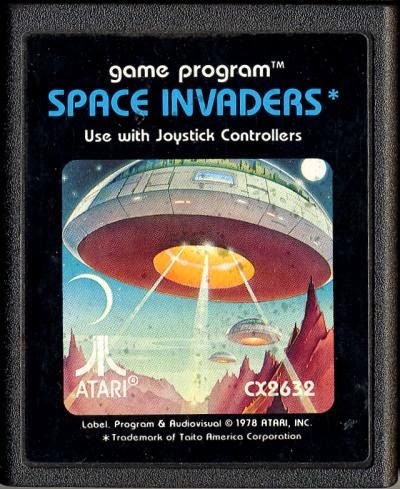 Space Invaders has 112; in fact, it's often labeled as "112 Tele-Games," or some variation thereof. If you just get a loose cartridge, be sure to look up the manual online to check out all the different ways you can switch-up the gameplay in this iconic classic. This is another one that never gets old, even if it does look a bit prettier on other consoles. This game is especially fun if you've got a second player to compete against (although it's 2-player in the style of Super Mario Bros., not direct versus as in Street Fighter or Combat). Take up your lance, mount your battle ostrich, and flap your way to victory! It's also fairly easy to find and hence won't cost you a lot. This one practically defines addictive gameplay. 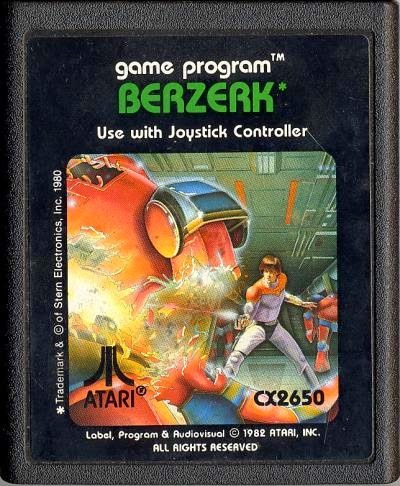 If you happen upon an Atari Trak-Ball controller, definitely make sure this game is in your collection (along with Missile Command, but I'm already cheating on the 7 games here from the first entry). It's simple but challenging: fire away at the incoming centipede, watching out for its friends (like that irritating spider who appears every couple seconds). If you've ever played this in the arcades (lucky you), you'll know this game has incredible replay value as you try to get your high score just a bit higher (or at least to the next extra life). Here's another one that'll have you going for hours, to the point where your hand may start to reshape itself around the joystick controller. Make your way through an endless maze, shooting robots and avoiding their shots. You'll soon get used to the controls, where you fire in the direction you're walking (diagonals take some practice). Tip: Unless you're an absolute newbie, always play at least on Game 2, which features the menacing Evil Otto, who bounces on screen to chase you down should you take too long in a single room. Nothing adds challenge quite like a smiling time limit. He's always smiling, even as he's plotting your demise. The last thing you'll see is his smiling face...body...going through walls as if they weren't there. The fewer robots on screen, the faster he travels. Just gotta keep going. This one's another unquestioned classic, one I've mentioned at least once before on this blog. 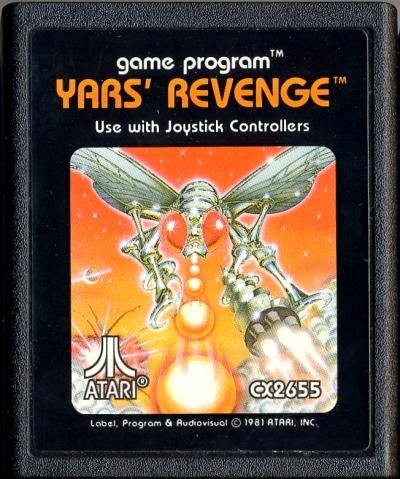 You take control of the bug-like Yar and go up against the ruthless Qotile. This one really gets challenging in the later stages, when the missile that follows you around starts to speed up, meaning you can't stay in one place for too long. It might only have two distinct stages, but the challenge is more than enough. It's also pretty common, so it shouldn't be too difficult to find or too expensive. ...but I'm limited here, and I'm trying to put in a nice variety. 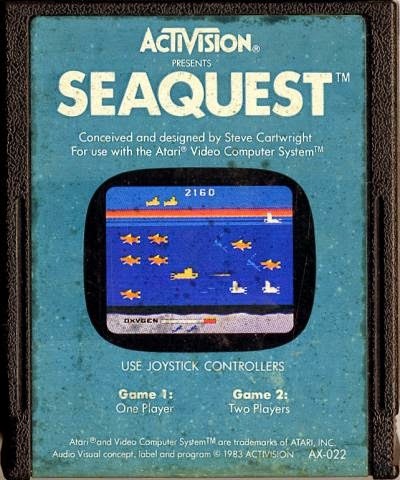 Seaquest is probably one of my favorite games for the Atari 2600, as anyone who's read this blog will know. Short version: you control a yellow submarine (Beatles reference!) and must save six hapless divers per round, while avoiding sharks and enemy subs (who start to travel in twos and threes in later rounds), as well as a really annoying ship that travels along the surface to keep you from coming back up to recharge your oxygen. So if you can only get one Activision game, get this one. If you can get two, get Pitfall....actually...can I rename this entry to Seaquest AND Pitfall? Hey, this is my blog; I can cheat if I want. Really, this is another expected one. If you've never heard of Pitfall, I'm sure you've seen it, or references to it. Jump across barrels and crocodiles, swing across lakes and pits, collect loot. Get this game; it's practically a requirement anyway. 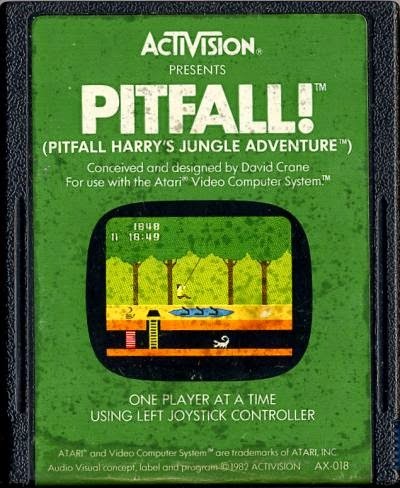 Tell anyone you have an Atari 2600, and they'll probably ask if you have Pitfall. Make sure you can tell them all "Yes." Is that man playing Galaga? 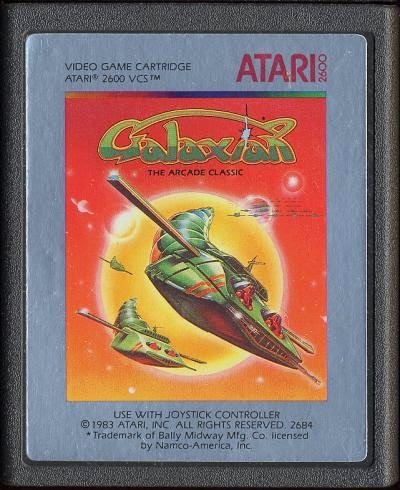 Nope; it's Galaxian, the game that started the whole series. 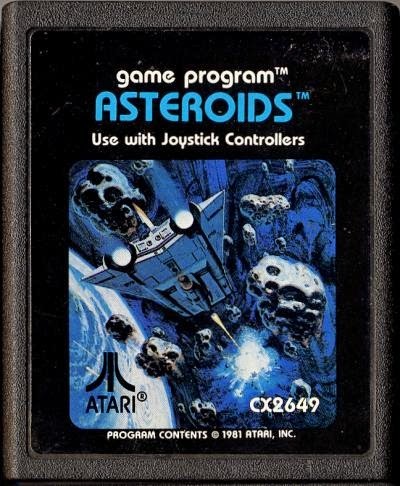 This is one of the best games for the Atari 2600, without a doubt. It takes the basic formula of Space Invaders and adds the challenge of targets that fly directly at you. Remember that you can only have one bullet on screen at a time, so aim your shots well. Also, remember that you get more points for hitting an incoming enemy than one that's just keeping formation. And whatever you do, don't get trapped in the corner. Bad idea. Keep moving, and watch for your openings to avoid getting trapped. Also remember that you can score big points by picking off the two red ships and then the white leader ship. If the challenge is too paltry, try using the Game Select switch to change your starting level. I usually start at level 9 (the highest) for the extra challenge. So there you go...step number one is to get yourself an Atari 2600 console. Step number two is to get the games on this list. Have fun! P.S. If you're the type who likes to watch YouTube videos and also a lot of Top 5 lists, you should totally check out my friends 2MooglesGaming. They're awesome. All images from AtariAge.com...they're a great resource, so I also advise checking them out regularly. Those of you who follow me on Twitter will know that I've recently been working on some programming on my Atari 800XL computer (well, both of them, since I have two). That means using BASIC, and specifically Atari BASIC. While I learned some BASIC as a young ninja, it's been a bit of a journey so far on the Atari, for a couple of reasons. Firstly, it's been a while, and I had forgotten a lot. Secondly, I never really learned all that much to begin with, being only around 10 years old at the time. And thirdly, Atari BASIC is a distinctly different flavor of BASIC from what I learned. In any case, I recently managed to spit out a short program, which I also shared on Twitter. What I wanted was something that would spit out a specified lines of random letters/symbols either to the screen or to a printer. Why would I want such a thing? Because reasons...Reasons I say! So anyway...I figured I'd talk a bit about this program, my thought processes while writing it, etc. It'll be an educational column for some, especially in the area of how little I know, and I hope it'll at least be somewhat entertaining. Disclaimer: Please do not mistake me for an expert (or even a mildly proficient) in programming. This is mostly just me playing around with forces I cannot possibly hope to comprehend. 8 POSITION 10,6:? "OKAY, WILL PRINT." 9 POSITION 10,8:? "MAKE SURE PRINTER IS ON." 10 FOR W=1 TO 500:NEXT W:PRINT "}"
I'm positive that this program has been written before, and better, but this is what I done wrote, and I'm sort of proud of it. By the way, wherever you see a "}" character, replace it in your mind with the "clear screen" symbol from Atari BASIC, which looks a bit like "↰." If you're not familiar with BASIC, each line begins with a number which determines its order. Common practice is to begin with line 10 and enter new lines in multiples of 10 (or sometimes start with 100 and go in multiples of 100) so that, as needed, lines can be inserted in between others without re-numbering. That should give you a bit of an idea of the order in which some lines were added here (actually, I did re-do line 10 at least once, but you get the picture). For those to whom this still looks like ancient Sanskrit, here's the overview: the program asks for a number of lines, and whether or not the output should go to a printer. Then it generates a line of random characters, then another, and so on until it has output the number of lines specified. First thing to note about this line is that "?" is a shortcut for the PRINT command, which tells the computer to print a text string. So this line first tells the computer to print a "clear screen" character, which blanks out anything on-screen at the time. The second part of the line (two commands can be on the same line if separated by a colon) is a command that directly changes a memory location — specifically, it turns off the cursor, which makes things look a bit neater. This second line is here because of a peculiarity of Atari BASIC. While in some versions of BASIC you can just use string variables (contrasted with number variables) at will, in Atari BASIC you must first DIMension them, telling the program how many characters to allot the variable. So this line declares a string variable called Q$ which has a maximum length of 1. These two lines are the two big questions asked at the start. First, the (invisible) cursor is moved to column 10, row 3. Then the prompt "# ROWS" is printed, followed by an input for a number variable called R (the number of rows to print). Then it moves two lines down, to column 10, row 5 and asks the second question, whether or not to print the output to a printer. Here is where we use the string variable Q$ which we DIMensioned a couple lines ago. Also note another peculiarity of Atari BASIC: PRINT commands must be separate from INPUT commands. On a Commodore 64, for example, I could input instead 3 POSITION 10,3 : INPUT "# ROWS";R, but not so on the Atari. These next few lines are partially feedback to the user and partially error handling in regards to the INPUT command on line 4. Since the user may have entered any character at the prompt, it needs to weed out anything but "Y" or "N."
First, it handles the case where the user entered "N." It moves down to row 6, tells the user that the output will not be printed, and then moves to line 10 for further instructions. The next line is there because ATARI basic only follows an IF/THEN model for conditionals, not an IF/THEN/ELSE model. If the IF condition is true, the THEN is executed, and if not it just goes to the next line. So now the program weeds out anything that isn't a response of "Y," since any "N" responses were caught by the previous line. For all of these responses, it prints an error message, allows the user to re-input for Q$, then moves back to the first conditional statement. If anything made it through lines 5 and 6 without triggering one of the THEN clauses, it's because the user entered "Y." So the next two lines (there was a line 7 at one point) just offer feedback and remind the user that the printer needs to be turned on. Okay, now we really get into the operations of the program. First, line 10 uses a FOR/NEXT loop, which will be talked about in a couple lines. Basically what it does is tell the computer to execute a set of commands a given number of times. In this case, though, the loop is empty, so the computer does nothing 500 times (the 1 to 500 part). This is a sort of messy way (which depends on running in Atari BASIC on an 800XL) of causing a delay, which in this case is long enough for the user to read feedback messages before the second half of the line clears the screen again. A professional would use a more precise clock, but I'm not a professional. Lines 11 and 20 DIMension two more string variables, which are the ones that are really going to be used in the program. Y$ has a maximum length of 80, and X$ has a maximum length of 1. Line 25 starts another FOR/NEXT loop, using the variabl R that was entered in line 3. So for R times, the program will repeat whatever comes between this statement and a line that says "NEXT S."
The next two lines toggle between two different line lengths. Atari BASIC in the standard text mode can only display 40 characters across, while a printer can do 80 characters to a line. So if the user entered "N" for Q$, the program goes to line 30, which starts a FOR/NEXT loop that repeats 36 times (because the line starts a couple of characters in) and otherwise goes to the next line down, which starts a different loop that goes to 80. The second part of line 27 skips it past line 30. So the loop started by either line 27 or line 30 will do the same thing (for R times, because it's nested within the S loop from line 25). Here's the real mechanism. These two lines are the repeated steps that churn out the text. Line 40 sets the X$ string variable equal to a random character. It does this by making use of the CHR$() function, which outputs the Atari ASCII (also known as ATASCII) character with a given numeric value. It also uses the built in RND() function, which outputs a random number between 0 and 1. So at the heart of the expression in line 40, it takes a random number (the 1 in parentheses doesn't really have any effect) and multiplies it by 59, which is 123-64 (the random number never equals 1, so I have to go one beyond my target range). Then it uses the INT() function to strip out decimals and just use the closest integer. Then it adds 64. So now it will output random numbers from 64-122. Line 50 is where I had to get creative. There's unfortunately no string concatenation function in Atari BASIC, so I couldn't just build up a line by going X$+X$+X$, and so on. However, it is possible to specify a character position within a string variable. Y$(1) means the first character of the Y$ string variable, and so on. So this line uses the step number of I (which is incremented by 1 each time the FOR/NEXT loop churns) as the position indicator on Y$ and copies over the randomly generated character of X$ onto it. Line 60 completes the loop begun in line 27/30, which eventually builds up a line of the required length. The next couple lines are the output end of the program. Depending on the value of Q$, the program will either use the LPRINT command to print the value of Y$ to the printer (and then go to line 80) or print it to the screen. Line 80 completes the loop begun in line 25 and causes the next line to be generated, until the required number of lines are generated. Okay, here we are at the wrap-up. After everything's printed out, the cursor is turned back on and the program terminates (until the users types "RUN" again). So yeah. Took me a bit of noodling to get this one to work, but there it is. Actually, there are a number of improvements I should make to it. For one thing, I should make the user hit a key at line 9 before it moves on, to be sure it doesn't execute before the user has a chance to turn on the printer. For another thing, it might be a good idea to add a line counter, especially when the user's printing a large number of lines to a printed page, as a bit of a progress meter. I have an idea of how I'd do it, but since I currently have no way of saving programs (gotta get an external floppy drive at some point), that's just gonna wait for now. * Fun thing to do if you're using laptop running Linux in a public space: either open a new terminal emulator window or go to a virtual console and run either (a) sudo apt-get update or (b) cmatrix. People walking by will think you're either a hacker or a spy. Totally. ** It wouldn't be straightforward to filter out the range of values for the punctuation characters the way I did it here. I could have just generated the text based on a string variable containing all the alphanumeric characters, but hey, that's hindsight for you. The store's name is La Planque Jeux Vidéo. Be sure to check out their website, their Facebook page, and, should you ever find yourself in the city, their store. Seriously, it's awesome. Killer Instinct and Mortal Kombat 2 on free-play!